I know how stressful it can be to deal with a cancer diagnosis and treatment or to watch a loved one suffer. So I’ve assembled what I think are essential practices for cultivating peace of mind and enlivening the body. To Buy Now Click HERE! Learn about the essential yoga practices that support the healing process. Designed with a cancer patient in mind, but perfect for anyone dealing with a serious or chronic illness. Harness the healing power of your body and mind through these ancient yogic practices. Check out the mini-course by clicking HERE. 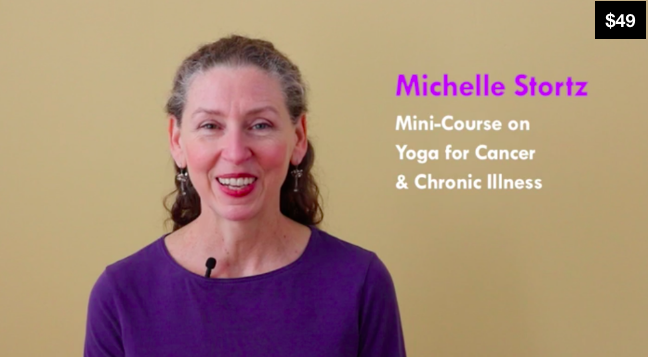 Michelle Stortz, C-IAYT, RYT500, MFA, is a certified yoga therapist specializing in yoga for cancer and chronic illness. She works in numerous medical settings in the Philadelphia area and enjoys designing custom yoga programs that anyone can do regardless of ability. Her teaching is augmented by her studies in meditation, Buddhism, contemporary dance/somatic practices, Reiki and she is a certified Divine Sleep Yoga Nidra facilitator.